In this issue of Guitarist Presents Acoustic : "As the leaves begin to turn, what better time to pick up an acoustic guitar and start honing your songcraft and playing technique? In the autumn issue of Guitarist Presents Acoustic, we get stuck into essential techniques with a masterly lesson in country-jazz picking with acoustic virtuoso Tommy Emmanuel, with full TAB and video. Elsewhere in the issue, we join CSN legend Graham Nash to talk about songwriting, Neil Young and the timeless appeal of Martin acoustics. If that whets your appetite for classic guitar design, dive into our in-depth feature on Martin's history and greatest guitars, featuring reference-grade photography of Holy Grail Martins including pre-war D-45s and more, plus a look round the modern-day Martin factory in Nazareth Pennsylvania. 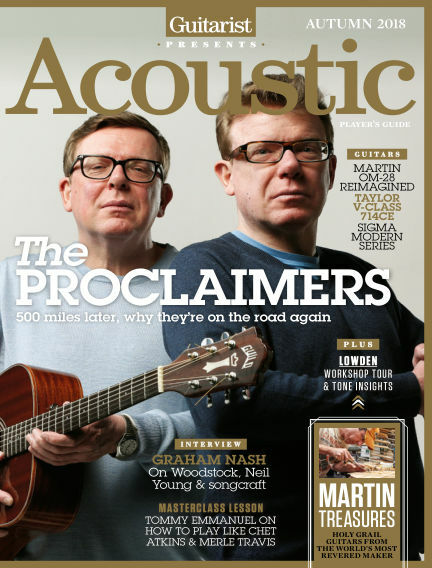 Finally, we join Scotland's greatest songwriting export, The Proclaimers - who grace this issue's cover - to talk about their new album and the celtic roots of their sound. A host of insightful reviews of the best new acoustic gear round out an essential issue for lovers of all things unplugged. With Readly you can read Guitarist Presents Acoustic (issue Autumn 2018) and thousands of other magazines on your tablet and smartphone. Get access to all with just one subscription. New releases and back issues – all included.